Peerdea is a place for people to post their concepts (art, website, music, etc. ), and for others to give feedback on such concepts. There are strict posting guidelines and a point system, both of which serve to encourage constructive feedback. 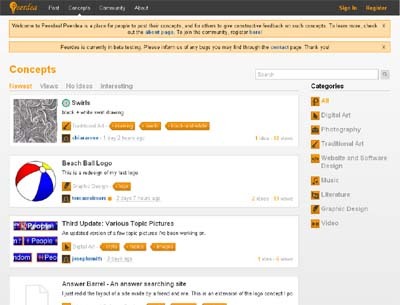 Unlike most forum-like sites online, Peerdea is focused on providing constructive feedback. On most sites, feedback usually comes in the form of “this is good” or “this is bad”. On Peerdea, such feedback is discouraged; giving helpful feedback is the goal.